The FBI conduct a raid on Dannenbaum Engineering Corporation on West Nolana Ave. April 26, 2017 in McAllen. The Hidalgo County Regional Mobility Authority cut ties with an engineering firm that is under FBI investigation shortly after agents raided the firm’s McAllen office last year, HCRMA Executive Director Pilar Rodriguez said Wednesday. Dannenbaum Engineering Corp. was overseeing a consortium of engineers for the HCRMA when agents raided four of its eight offices in April 2017. At the time, the company was operating under a roughly $10.3 million contract to serve as the program manager for two segments of a proposed loop the HCRMA is building. “So they were the engineers that were watching over the other engineers,” Rodriguez said about Dannenbaum, which did not provide any design work for the project. After the FBI raid — which spanned across Texas from McAllen to Laredo to San Antonio and Houston — the firm came under scrutiny by local government entities that were debating how to move forward with projects that were either already on the books or were in the process of being awarded to the firm. Hidalgo County, for example, was in the middle of negotiations with Dannenbaum when the raids happened. The firm, working along with four other companies, was the frontrunner to oversee the construction of the new county courthouse, but almost immediately after news broke about the FBI investigation, Hidalgo County Judge Ramon Garcia said he was prepared to recommend terminating negotiations. A few days after, Garcia followed through, and together with commissioners the county terminated the negotiations, and soon after hired Jacobs Program Management to lead the effort. The HCRMA board also met to discuss the issue a few days after the raid, but the board did not take action on the item. Instead, board members met again a few weeks later on May 23, 2017, and that’s when the board voted to cut ties with the engineering firm. “We had some issue with their performance, so the board thought it was in the best interest of the authority to sever ties and move on,” Rodriguez said about HCRMA. 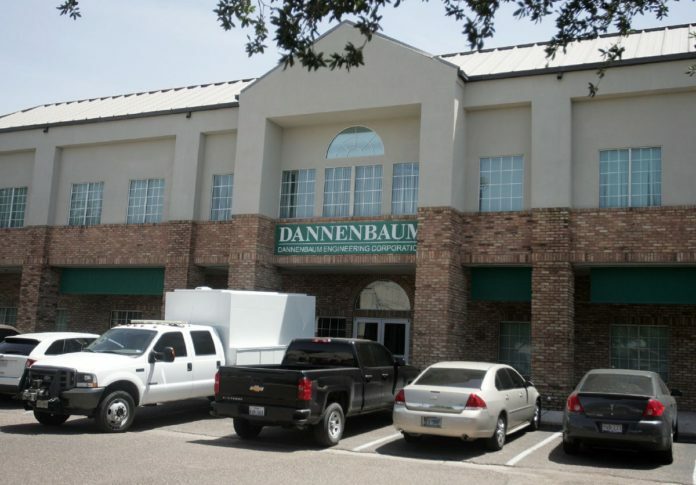 Because the contract was cut short, the HCRMA only paid Dannenbaum about $8.2 million for work the company provided during a 5-and-a-half year span, beginning December 2011. Afterward distancing itself from Dannenbaum, the board hired HDR, a global architecture company that traces its 100-year-old roots to Nebraska, on a temporary one-year contract to oversee the construction of two segments of the loop: Tollway 365 and the International Bridge Trade Corridor. This time, however, HDR was hired under a work-authorization basis and the board negotiated an hourly rate for the work the company provided. The HCRMA also hired a chief development engineer to help keep some of the work in-house. “We hired HDR to take care of the disciplines that we didn’t have expertise in-house,” Rodriguez said. At the end of the one-year contract, HDR was ultimately paid about $204,000 for the work it provided, and the HCRMA sent out a request for statements of qualification. “We received three responses and we went through the grading and ranking system, (and) HDR came out on top,” the executive director said. The board was scheduled to approve the new contract during their last meeting on Tuesday, but there were still some legal kinks that had to be worked out, Rodriguez said, adding they will likely approve the new contract at their next meeting.